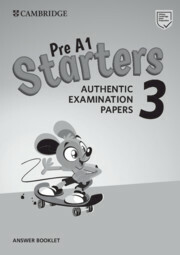 Authentic examination papers for learners preparing for the revised Pre A1 Starters, A1 Movers and A2 Flyers exams as introduced in 2018. This Answer Booklet accompanies Pre A1 Starters 3 Student's Book and Audio CD. It contains answers for all three tests, the tapescripts and examples of the type of interchange to expect in the Speaking test. It also includes the Pre A1 Starters Vocabulary list, organised by theme. 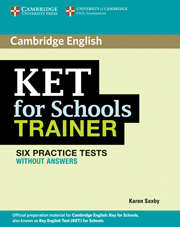 An Audio CD (which contains the listening sections of the tests) and the Student's Book are available separately. Six full practice tests plus easy-to-follow expert guidance and exam tips designed to guarantee exam success.